"Our level of commitment is what separates us from other coaches and gyms across the city. You aren't just a client at Capital Strength, you are part of the family." We are now more than two weeks into the new year, and this is where we start to think about our New Year's resolutions and the progress we have made so far. It is at this point that many people either abandon their goals, or start to make their progress routine. CARHA Hockey wants to help you avoid abandoning your goals and encourage you along your fitness journey. We have partnered with Capital Strength in Ottawa to give you the opportunity to WIN a free month-long membership at their facility, as well as three personal training sessions with a fitness professional. Entering is easy - simply send us a photo of you working out and you'll be entered to win. 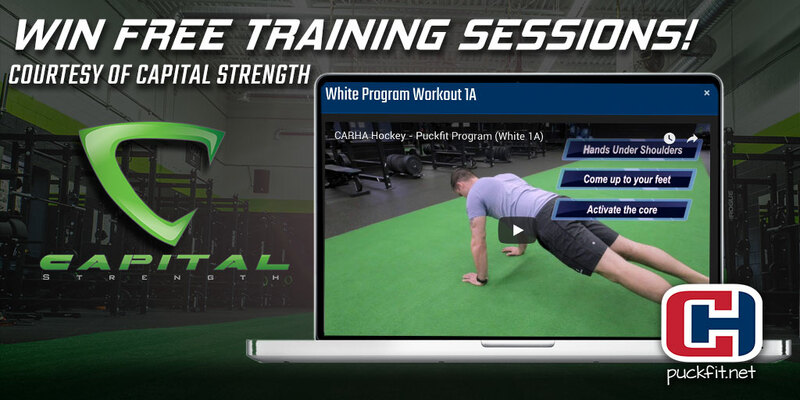 Check out our PUCKFIT program if you need some easy, at-home workouts to get you started. Contest closes on Friday, February 2nd at 12PM (EST). Let's make 2018 our year!